Tengu derives its name from a mythical Japanese creature known for getting into mischief. Our Tengu, however is more earthly in nature. It responds to voice and sounds and takes on different facial features depending on the intensity of the sound. If no sound is heard for some time, it changes from a happy face to a sad face and then goes to sleep. Gently blowing on his face wakes him back up to his usual happy self. 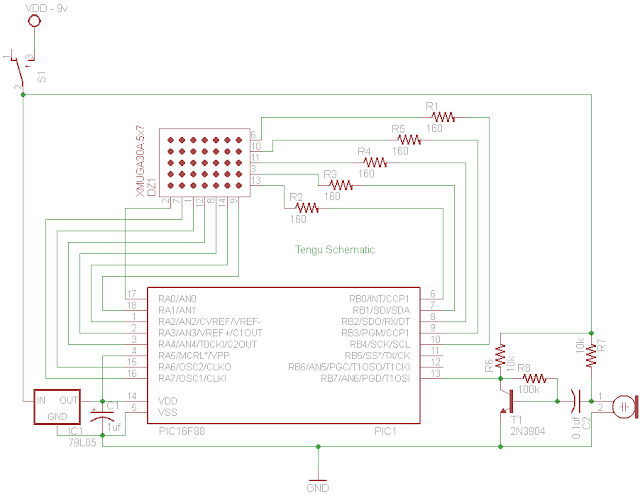 The project is based on a Microchip PIC 16F88 which is part of their mid range of microcontrollers. 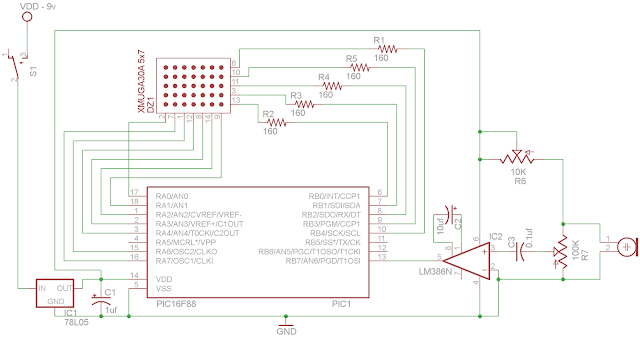 The sound is amplified through a pre-amp circuit based on 2N3904 and fed to the RB7/AN6 (pin 13) of the pic microcontroller. The A/D converter on the microcontroller is used to convert the analog signal from the pre-amp. The LED Matrix is directly driven by the pic. In order to be able to display the entire smiley, the LED dot matrix is multiplexed in such a way that only one row out of the seven is active at any given time. However the rows are turned on and off so rapidly, the human eye sees it as a full picture. This effect is called the persistence of vision. 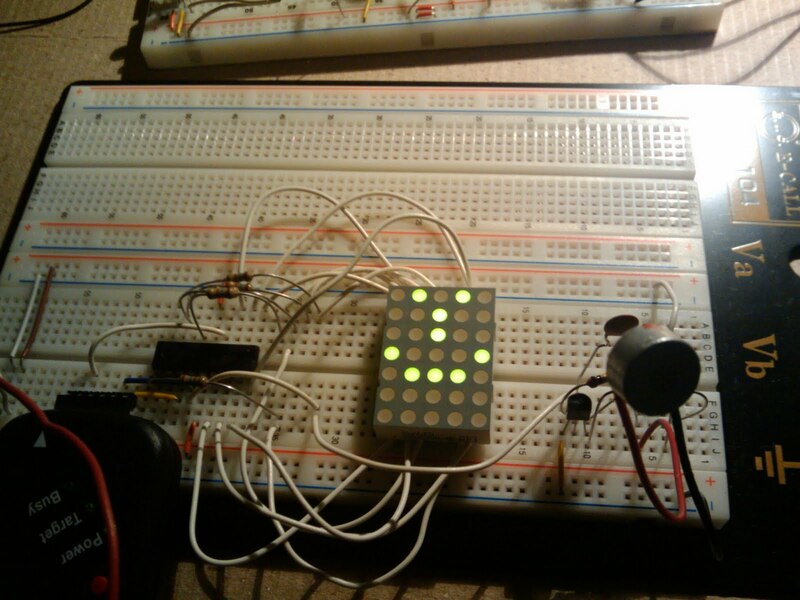 In order to achieve multiplexing, timer 0 on the pic is running at approximately 1 ms timeouts to switch the row that is being displayed on the LED Matrix. Timer 1 is configured as a general purpose timer used to keep track of the time since any noise over the threshold was heard. This is used to change the smiley from a happy to a sad one. The code is written in C using MPLAB and Hi-Tech C compiler ver 9.80. The gain I was getting on the amp circuit above was only moderate. I changed the circuit to use a LM386 based on Jose Pino's circuit and got a much better gain. The circuit diagram is below. The 10K potentiometer is used to adjust the sensitivity of the mic while the 100K potentiometer is used to adjust the gain. im currently doing a project using pt2272 and pt2262 ic (http://www.cytron.com.my/listProducts.php?actionURL=&txtSearch=2272&hdTxtAddedIntoCart=Added+Into+Cart&hdTxtFailedToAdd=Failed+to+Add+to+Cart%2C+Please+Retry&slSortBy=updatedatetime&slSortDirection=DESC&cartQty_2788=1) but i cant find that particular chip in Eagle to do my simulation. Any suggestion on which IC to be used in Eagle that have same function as pt2262 and pt2272? thanks for u r posts with diagrams which made me understand more easily.